You’ve probably heard about STEAM by now from the news, your child’s school, your job, or even us at TGA. If you aren’t familiar with the term, it stands for Science, Technology, Engineering, Arts, and Math. 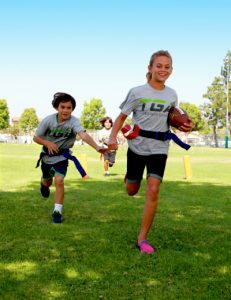 We incorporate lessons into TGA programs to show students that these disciplines are all around us, especially in sports. Let’s look at one of the biggest sporting events of each year, the Super Bowl, as an example. SCIENCE – Gravity, force, aerodynamics, and friction impact the sport of football itself. For example, the amount of force used to throw or kick the ball impacts the distance it will travel. TECHNOLOGY – Broadcasting the game around the world with replays, a “magical” yellow first-down line for every play, and commentators require a complicated equipment to work. ENGINEERING – U.S. Bank Stadium in Minneapolis, Minnesota hosted Super Bowl LII. With over 60,000 in attendance, structural engineers have worked with architects to ensure that the stadium can safely accommodate the attendees, employees, and players. ART – Many viewers tune into the Super Bowl only for the commercials and half-time show, both of which are created through many artistic visions. MATH – Coaches work with statisticians to generate the analytics used to determine which plays to call and when. It’s important to introduce these concepts at an early age because these fields are our children’s future. STEAM jobs have been growing three times faster than non-STEAM jobs while new technology is being introduced all the time. Within the next decade, it’s estimated that 80% of jobs will require STEAM skills. Sports offer an ideal lens to make these concepts more relatable to children. Our coaches introduce STEAM ideas throughout class to help kids better understand the sport they’re playing. Topics such as spin and force (science), keeping score (math), and equipment design (engineering), are broached organically throughout stations and games. By asking questions, we challenge our students to solve problems and encourage them to think about how these concepts apply to world beyond sports. 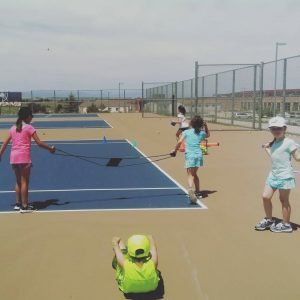 We aim to inspire kids to have an interest in STEAM related fields inside and outside of sports. Some TGA offer hands on experiments developed using sports related science labs that explore concepts such as gravity and aerodynamics. Our labs, which follow the Next Generation Science Standards, help kids explore strategies, observe and record results, and discuss ways to improve or change the experiment to achieve different outcomes. Coaches relate results back to gameplay and skill development to reinforce how STEAM and sports are related. 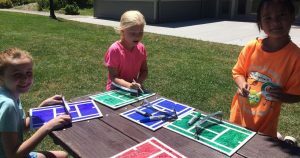 See a few of our STEAM Labs in action below and keep an eye out for these and other fun and engaging STEAM activities happening in TGA camps this summer.